Soulman, aka Star Soul, is a very handsome, 3½-year-old white and brindle male born April 23, 2005. His sire is Trojan Cruze and his dam is Barts Internet. Soulman's racing career started at the Woodlands Race Track in Kansas City, and ended there on August 17, 2008, when he broke his right hock. Surgery was performed and his leg is healed! 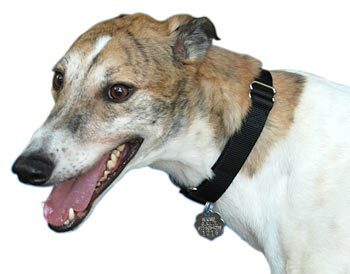 He was a kennel favorite and was described with having a "cuddle me" attitude, very cheerful and loving. 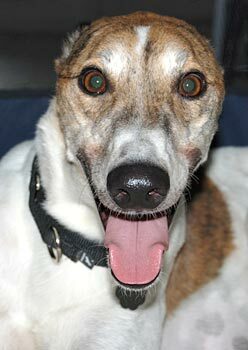 Soulman is living in a foster home with 2 cats, 3 greyhounds, and a senior female; he gets along well with everyone. Soulman is fine with small dogs. He met Princess and Breezy (both Chihuahuas) in his own foster home, and they don't get much smaller than a 4.5 lb Chihuahua (Breezy). Soulman is a very playful guy, so we had to keep him restrained with a leash for a while. Once his exuberance subsided, he was allowed off leash and the little canine guests were no big deal to him. He was more interested in the human guest.